The Nokia Asha 300 runs on the touch-enabled iteration of the Series 40 software. We already met with this version while reviewing the Asha 303, so if you’ve seen either of those, then you probably know pretty much everything about the S40 ticking inside the new Asha 300. We’ve reused some text from our Asha 303 review but rest assured we’ve reflected all Asha 300 specifics. There are just a few differences between the Asha 300 and the Asha 303 S40 user interface, such as the new slide-to-unlock lockscreen, but nothing major, really. The touch-enabled version of the S40 platform brings only skin-deep changes, like the refreshed icons a la Symbian-Anna, and a few usability improvements, like the homescreen swipes. Here is the Asha 300 on video, to give you an idea of what the touch-enabled S40 user interface looks like. Active standby mode (or Home screen mode, as Nokia call it here) is available as usual. It divides the screen into four sections, each of which is effectively a widget. The top row of the screen is reserved for status indicators (time, signal, etc.). By default, the clock is on top, followed by Social (Facebook, Twitter and Flickr integration) and two Shortcut bars at the bottom, each of which grants instant access to four favorite functions or apps. There are two swipe gestures available on the homescreen. A left or right swipe can be set to launch an app (both native and Java) or change the phone profile. By default, a left swipe opens the app collection and a right swipe opens the Java apps and games folder. There‘s no D-pad on the Nokia Asha 300 but the soft keys are there. Only virtual this time – they’re at the bottom of the screen, and there’s a virtual Menu key between them. The soft keys are user-configurable – you can assign your shortcut of choice to each of them. The familiar Go To shortcut is available and it's yet another way to add shortcuts to the homescreen. It’s the kind of quick menu we’ve seen on many S40 handsets, but having a touchscreen makes a huge difference. It offers quick access to nine different shortcuts. The lockscreen on the Nokia Asha 300 is pretty standard – a clock and a tap-to-unlock key. One thing missing is an accelerometer. 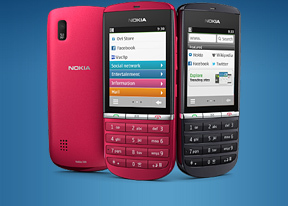 Unlike some of its S40 non-touch siblings, the Nokia Asha 300 leaves out features like tap-for-time and turn-to-mute. As for screen auto rotation, it’s not significantly missed given the screen size. Some might still find it a nuisance though – having to manually set display orientation where it matters: in the image gallery and the video player. The biggest omission as usual is multitasking – we’ve given up hope that Nokia will add that a long time ago. This leads to bottlenecks though they are rare. You can't leave it running in the background. You have to go through that every time you want to do something with the app, except check the latest notification (notifications do come in the background and only the last one is displayed).